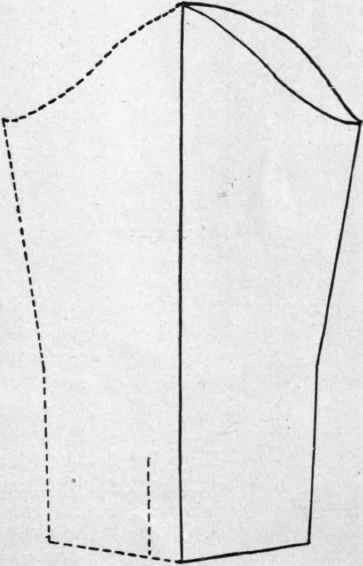 If one places the thumb under the arm and the first finger on the bone at the shoulder, in taking the width of back and width of chest measures, it is easier to locate a point at which to begin to take the measure, as the hand forms an armhole curve, from the center of which the measure should be taken. Review measures in the order and method of taking them. A few points still unnoted in Fig. 80 are the location of the shoulder and underarm seams. The shoulder seam on this pattern is found a little back of the very top of the shoulder, a good location. The upper end of this seam touches the neck band at a point about one-sixth of the distance around the neck, measuring from the center back. 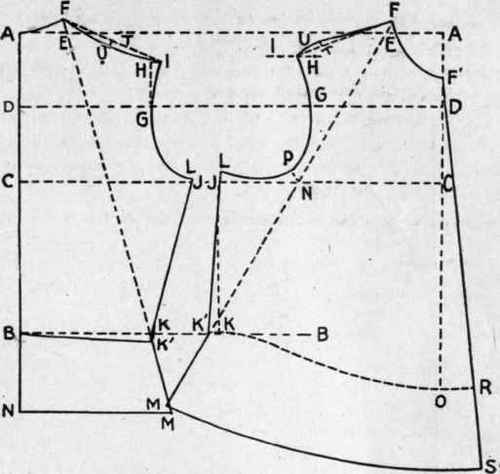 The opposite end at the armhole is the same distance (i.e., one-sixth of the neck measure) above the point at which the width of back was taken, but one-half inch nearer the arm. This determines another point for the location of the armhole. The top of this seam, which is directly below the end of the shoulder line, gives the last point of location for the armhole; at this point, the curve rises about one-half inch above the actual underarm measure. At the waist line, it falls toward the back a little, rather than at right angles to the waist line. Fig. 33. 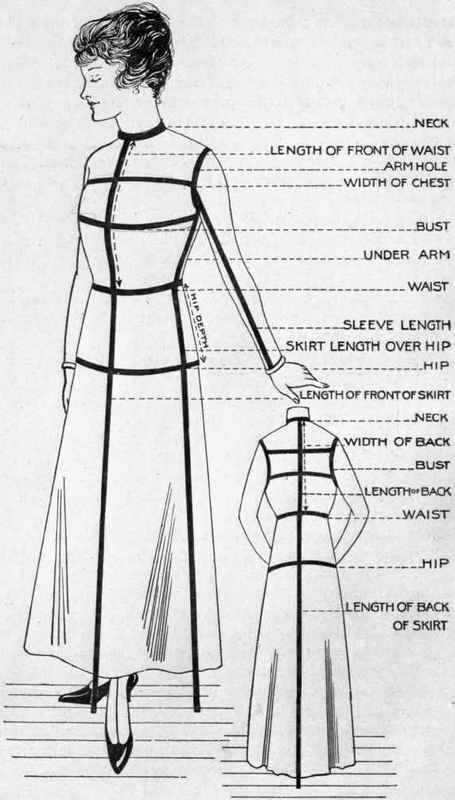 - Illustrating method of taking measures for drafting shirtwaist and skirt. It is sometimes difficult to see the relation of the lines of the flat drafted pattern to those of the figure. In Fig. 33 lines are shown on the form which represent the points at which the required measurements were taken and also show the relation of the construction lines of the pattern to the scheme of measures taken. In Fig. 34 the construction lines upon which the pattern would be drafted can be seen as they show through another pattern, which has been taken from the form, and laid over them. The relationship is not difficult to trace in this way. Fig. 34. 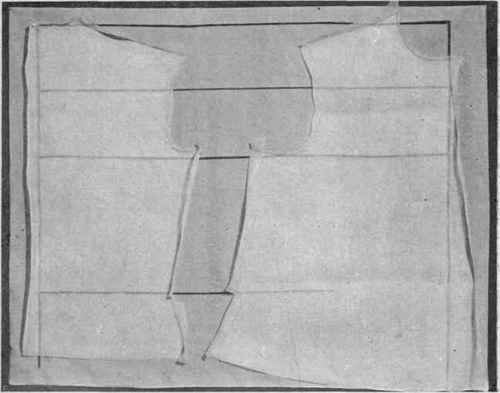 - Shirtwaist pattern draped on form, then laid over construction lines of drafted pattern to show the relation of the latter to a completed pattern. Reference to Fig. 33 for examination of the arm should easily discover the necessary measures for drafting the sleeve. The measure of the largest part of the arm is necessary in order to have the sleeve of sufficient girth. The length of the sleeve should be taken from the muscle at the point where the arm joins the body in front, to the wrist bone. From this measure the desired depth of the cuff should be deducted. In order to have the cuff the correct size and the requisite amount of fulness at the bottom of the sleeve, the measure of the hand, taken over the knuckles, with the fingers extended as for putting through sleeve, is also necessary. Add to this 1 ½ to 2 inches. The armhole measure should also be taken. Review measures required and the order and method of taking. AA equals line of indefinite length. AB equals length of back. BB equals waist line (two-thirds of AA). CC equals bust line (one-half of AB). DD equals width of back, and width of front line one-half of AC. AE equals one-sixth of neck measure. AF equals curve for neck. DG equals one-half width of back. HI equals one-half inch. FI equals shoulder line. CJ equals one-quarter bust measure minus 1% inches. BK equals one-quarter waist measure. KK1 equals one-quarter inch. BK1 equals waist measure. K1L equals underarm measure plus one-half inch through J. IGL equals armhole. KM equals four-inch ruler touching F and K1, Connect B and N; K and M; N and M, for bottom of waist. T equals one-half FI. TU equals one-quarter inch. FUI equals curve for shoulder. Fig. 35. - Draft for shirtwaist pattern. Front: (Fig. 35) AE equals one-sixth of neck measure plus three-eighth inch. EF equals one-half inch. AF1 equals one-sixth of neck measure. FF1 equals neck curve. DG equals one-half front measure. GH equals two-thirds DA (draw dotted line to left of H). FI equals shoulder line, one-quarter inch shorter than back shoulder, end of ruler on F, shoulder measure at I). CJ equals one-half bust measure minus CJ of the back. JK equals dotted line at right angles to CJ. KK1 equals one-half inch. E1L equals underarm measure plus one-half inch passing through J. FK1M equals dotted line F to A', extending four inches below K(M). N equals point of intersection lines CJ and FK. F10 equals length of front. NP equals three-quarter inch, ruler on 0 and N. IGPL equals armhole. OR equals one and three-quarter inches. R8 equals four inches. F1RS equals centre front line. K1OR equals waist line of front. MS equals bottom of front. T equals one-quarter IF. U equals one-quarter inch. IUF equals curve for front shoulder. Test armhole and neck of pattern by measures taken. Hold tape measure on edge when measuring curves. Fig. 36. - Draft of shirtwaist sleeve (gathered at top), cuff and collarband. AB equals line of indefinite length. AC equals one-quarter armhole plus three-quarter inch. CD equals inside length of sleeve. CE equals one-half width around top of arm plus desired fullness. EF equals one-half inch. AF equals dotted line. G equals one-half AF. OH equals line at right angles to AF, intersecting CE (point of intersection /). IJ equals three inches. If three-inch point falls outside AD, use point of intersection instead for J.
AF equals curve for top of upper sleeve (using J as pivot, J A as radius, to swing curve from A to K). FK equals one inch along curve. KE equals backward curve. GL equals one-half GA. LM equals one-eighth inch. GN equals one-half GF. NO equals one-quarter inch. AMGOE equals curve for top of under sleeve. DR equals one-half hand measure plus one-half desired fulness. PR equals curve for bottom of sleeve, straight one inch to left of R. PS equals one inch. ST equals four inches at right angles to PR. RE equals dotted line. RU equals one-half RE minus depth of cuff. UV equals one-half inch. EVR equals inside line of sleeve. Fold paper on line AP, and crease; trace outline of under sleeve, and cut out around pattern. Fig. 37 illustrates sleeve opened out. AB equals one-half neck measure plus one-half width of box plait, or hem. BC equals three-quarter inch. BE equals one-half AB. BF equals one-quarter inch. FEA equals bottom of band. CG equals three-quarter inch. AH equals one-eighth inch. FGH equals top line of band. Place AB on lengthwise thread for cutting out. AB equals one-half hand measure plus one and one-half to two inches. AG equals desired depth, two and one-half to three inches. ABCD equals rectangle. DE equals five-eighth-inch curve when round corners are desired. DF equals five-eighth-inch curve when round corners are desired. Place AC on crosswise fold for cutting out. Fig. 37. - Shirtwaist sleeve pattern opened out.